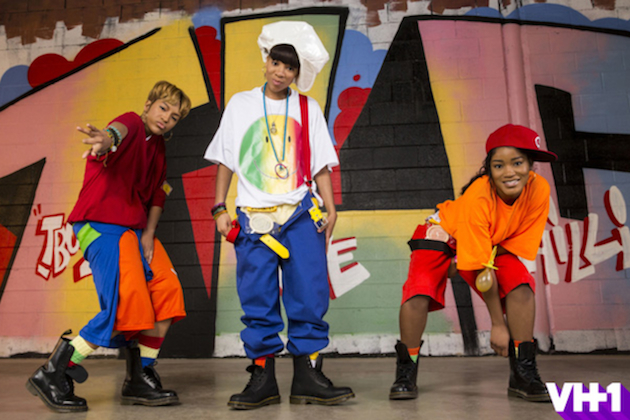 VH1 has released the first trailer to the upcoming TLC Biopic CrazySexyCool: The TLC Story, and it is pretty impressive. Set for release this October, people have been debating the project from the minute it was announced. Many questioned the young ladies chosen to fill the shoes of T-Boz, Left Eye, and Chilli (Drew Sidora, Lil Mama, and Keke Palmer respectively). Others thought that the movie shouldn’t have been made at all. But honestly, this was all premature. As I noted back in March in my post Why Everyone Needs to Chill Out About the TLC Biopic, it’s foolish to make such brash judgments with only a cast list to go off of. But not we have a trailer, so all bets are off. The trailer starts off with a sequence of stats about TLC, including sales figures and honors, set to their monstrous single “Creep”. And wouldn’t you know it, short clips from the video are dropped in their too. Only, it’s the three actresses donning the infamous silk pajamas and hitting the iconic dance moves. And they look good. Then a stadium of fans are chanting “TLC”, waiting for them to take the stage. Rochelle Aytes, playing the infamous role of Peri “Pebbles” Reid, then turns to the girls and asks if they are ready. Then the girls, in their spray-painted white jumpsuits from the Ooooooohhh… On the TLC Tip era, get hyped to take the stage. The main takeaway from this trailer is the immediate level of authenticity brought to the roles. I didn’t expect it to be terrible, but I also didn’t expect them to look so much the part. Even as they reenact a classic interview, the trio seems just as in sync as the originals were. Truthfully, we all pretty much know the story of the group, as it has been spilled across the news and related in Behind The Music broadcasts, so this trailer didn’t need to tell much of a story. All it needed to do was bring back that nostalgic love for TLC. And it does just that, weaving together footage of the girls taking on other iconic TLC videos like “What About Your Friends”, “Waterfalls”, and “No Scrubs”. In each piece, the styling is 100% authentic and the actresses dutifully take on their roles, down to the facial expressions. Pretty impressive work. In addition to the movie, TLC has a Greatest Hits album on the way, featuring collaborations with Ne-Yo, J. Cole, Drake, and Lady Gaga. Their new single, “Meant to Be” featuring Ne-Yo, is also coming soon. And the group is currently touring, stopping by the Mixtape Festival in Hershey, Pennsylvania Saturday July 27th. They have promised “surprises” during their set as to how they will manage Left-Eye’s portions. It could be Lil Mama or other artists or even a digital projection. But it doesn’t matter. Right now, everything seems to be going right for TLC. And this TLC fan can’t wait to see what is next. Check out the trailer below and tell us what you think about it in the comments section below!